Thank you for joining me as I wrote this. I appreciate having all of you with me. Many snookies to Hoshi ( hoshiko_malfoy) who wanted this fic. I hope I did your request justice. Snooks. The thaw came quick, moving in with a hot kiss and shattering the frozen veneer winter laid over the city. Within days, the eaves ran slick with melted ice and Sungkyunkwan’s pages scurried to spread sand over the walkways’ growing puddles, lugging hammocks of mounded grit between them in a frantic race to beat the scholars before they came home. The students arrived in dribbles, one or two at time. Many admonished themselves for not taking the time to keep up with their studies, especially when welcomed at the entrance by a sign announcing points-dependent tests covering their most recent materials. A warbler scolded Yoon Hee as she made her way through the soggy yard. Burdened by heavy satchels filled with food, she nearly lost her footing when her shoe slipped on a patch of ice on the pavement. Flailing to keep her balance, she came to a jerking stop when two strong arms caught her before she fell. “You cannot expect to be able to walk when you are carrying things as heavy and as tall as you are,” Lee Sun Joon righted his fiancé, putting her back on her feet. Removing the satchels from her nerveless fingers, she glared at his imperious tone. “I can carry that,” Yoon Hee snarled. Sun Joon ignored her, continuing down the pavement towards their dormitory. His servant bowed with deep courtesy, giggling at her vexed expression. “She’s gotten bossy now that she’s student president,” His servant muttered as he fell in behind his master. She found them in one of the gardens, its plum blossoms beginning to break through their snowy confines and speckling the nearly bare branches with delicate pink clouds. Jae Shin sat on a stone rise, nearly hidden by a gardening shack and lost in thought, his hooded eyes watching Yong Ha as the man struggled to reach some of the more pleasing arrangement of flowers, a set of snipping clippers in his hand. Several sprigs lay on the ground, carefully placed on a flat rock where he couldn’t accidently step on them. His gat lay abandoned on the ground, its black horsehair ridge battered slightly from being smashed up against the lower branches. Her robes fluttered, barely disturbed by his push and she laughed at him, settling down next to him. The cold stone seeped through her clothes and she gasped in surprise. Tapping her shoulder, Jae Shin jerked his hand up, motioning her to rise. Lifting his own hips, he unfolded a flap of the mat he’d been sitting on, spreading it out to share with the young woman. “They’re pretty,” Yoon Hee remarked, taking a deep breath to catch the sweet, light fragrance permeated with the fresh wash of winter. Yoon Hee watched as Yong Ha strained to reach a branch above him, jumping up to grab at the tree. Unable to reach his target, he instead jostled the slender trunk, dislodging clumps of snow which fell on his head. Jae Shin chuckled and Yong Ha turned around to glare at him, offering out the clippers. “Do you think you could do a better job?” He spat out a mouthful of snow-frosted bark chips. Yong Ha pulled a grimace at his lover then snatched up the branches he’d been lucky enough to clip off before damaging his ego any further. Calling out to a passing page, he bribed the boy to bring them hot soju to drink before settling down to direct his lover. “So, have you and Sun Joon done anything with that book I gave you?” Yong Ha leaned over and whispered into Yoon Hee’s ear. Lee Sun Joon wandered into the garden area and studied the scholars sitting next to one another. Pursing his mouth, the scholar glanced about and his eyes lit on Jae Shin. Changing course, Sun Joon strode over to where the other man was beginning to climb one of the heavier plum trees, the clippers clenched between his teeth. He poured Yoon Hee a cup, wrapping the bottle back up to keep it warm for Jae Shin. They sat sipping at the spiced alcohol and Yong Ha shouted out directions periodically to guide Jae Shin towards the branches he wanted. He put down his cup to pound her back, holding a startled Sun Joon off with a nonchalant wave of his fingers. She coughed, clearing her throat and sucked in a mouthful of air, glaring at her senior malevolently. “So then, you two are…” She trailed off, unsure of how to phrase their unorthodox relationship. Her mouth was full again when Yong Ha whispered. The sound of her choking once more filled the air and this time, no amount of pounding on her back helped clear it. Shoving the man away from her side, Yoon Hee caught her breath and muttered about Yong Ha and his wicked ways. Jae Shin padded up to join them, holding the clippers out to Yong Ha. Sun Joon was close behind, his arms full of fragrant branches. Exclaiming loudly with pleasure, Yong Ha motioned for the man to place them on the ground before him, pouring out two cups of soju before picking through the selection. Draining his cup, Sun Joon was about to pour himself another when Yoon Hee grabbed at his wrist. Using his weight to pull herself up, she bowed a quick goodbye to Jae Shin and scurried off, dragging an astonished Lee Sun Joon with her. “What bit Daemul?” Jae Shin grumbled, removing the stopper of the container and drinking directly from the bottle. “Her face is all red. It was Jae Shin’s turn to blush and he turned his head away, unable to meet his lover’s teasing with a sharp retort. He’d discovered how easily it was to lose himself in the passions they had for each other, often marking Yong Ha with his teeth or gripping him tightly by the hips. Unlike the marks Dae Min inflicted on himself, the lingering mottles were subtle, not at all painful to look upon. Jae Shin had to admit to himself, he liked seeing the tiny marks he left behind on Yong Ha’s body. Even better, they allowed him to lave and kiss the spots to make them feel better; which usually led to more markings. “They’re…traditional,” Jae Shin replied, frowning at a branch being held up to his face. 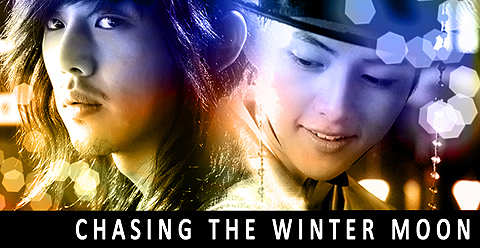 Lowering the branch, Yong Ha gazed into his lover’s face. Jae Shin’s expression was soft, unguarded and as vulnerable as when they were making love and Yong Ha sighed with pleasure, knowing the man’s gentleness was something only he was allowed to see. what a perfect way to end this though now i'm sad i won't be reading Jae Shin and Yong Ha fics. are u going to write any side shots for Soon Joon and Yoon Hee? the way u wrote here is just lovely and i would love to read something with them as the main pairing. thank you for sharing this masterpiece, i was always so anxious waiting for a new chapter, and now that it's over, i'm sad but happy that they're happy and together. :] I love what you did with this pairing, and the ending was great even though I didn't really want it to end. You should do a side story with Yoon Hee and Sun Joon! ♥♥♥♥♥ smooches. and thank you for being here! gah! you finally ended it with something I wanted th writers of skks to do! A SCENE OF THE 4 of them TOGETHER!!! ♥♥♥♥♥ heh. smooches. and hugs. smooches and i'm happy you liked it and were here reading.